Not only is New Year’s the time to celebrate the year that has just passed, but it is also the time to set new resolutions for the year to come. For financial markets, especially the stock market, 2017 was a special year of celebration. In addition to the S&P 500 index rejoicing a +19% gain, the more narrowly focused Dow Jones Industrial Average (consisting solely of 30 stocks) partied to an even more impressive +25% advance. Out of the three major stock indexes, the icing on the cake can be savored by the technology-heavy NASDAQ index, which soared +28% in 2017. The year 2018 also happens to be a special year that marks a significant milestone in my professional career. A decade ago in late 2007, I ventured off from managing one of the largest multi-billion growth funds in the country (see How I Managed $20,000,000,000.00 by Age 32) and launched my own company, Sidoxia Capital Management in Newport Beach, California. 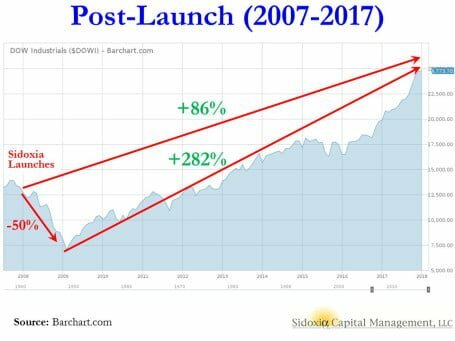 At the time of the launch (December 2007), and subsequent to the bursting of the 2000 technology bubble, stock prices had about doubled over a five year period, starting in early 2003 (see chart). 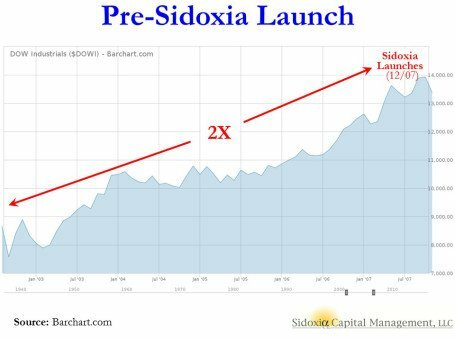 On top of having the leading investment credentials (CFA, MBA, and CFP) and the experience of successfully managing a multi-billion fund, I also held the youthful confidence and optimism of a 30-something year-old (Trivia fact: the name Sidoxia is derived from the Greek word for “optimism”). What could possibly go wrong? How about the worst financial collapse in a generation (79 years)! Suffice it to say, the global panic and recession that resulted in stock prices crumbling -50% (see chart below) temporarily bruised my youthful confidence and briefly punched my optimistic enthusiasm in the gut. In hindsight, what felt like a disaster at that point turned out to be a perfect time to start Sidoxia. The advantage of starting with virtually no clients meant that most of my early clients have enjoyed participating in a near quadrupling in stock prices to the near-record highs of today. However, it wasn’t all rainbows and unicorns over Sidoxia’s first ten years (2007 – 2017). Despite the Dow advancing to 24,719 today from the 2009-low of 6,470, there were at least 11 substantial corrections (price drops) ranging from -5% to -22%. The extraordinary climb up the financial mountain included a “Flash Crash”, U.S. debt downgrade, eurozone economic crisis, Ebola scare, Brexit vote, multiple presidential elections, and China recession scares, among numerous other fear-grabbing headlines. As I have described on numerous occasions (see also Fool’s Errand), predicting short-term directions in the stock market is a fruitless effort. With that said, our correctly positioned positive stance over the years can be clearly documented on my blog (see InvestingCaffeine.com). For example, 2017 was one of Sidoxia’s best years thanks in large part to our positive outlook (see Wiping Slate Clean), even though headlines were dominated by mass shootings, natural disasters, terrorist attacks, White House politics, Bitcoin/cryptocurrencies, and let’s not forget the sexual harassment revelations. But in going back to my previous comments, the key follow-up question becomes, “Do these headlines negatively impact the four key pillars of corporate profits, interest rates, valuations, and sentiment?” And the short answer is “No”. What could negatively impact investment results in 2018? For starters, overly aggressive (“hawkish”) monetary policy by the Federal Reserve could potentially slam the brakes on the economy. In my view this scenario is unlikely given the rhetoric and new composition of the Federal Open Market Committee, including new chief Jerome Powell. Regardless of the historically low Federal Funds rate, interest rate policy is definitely worth following in the coming months. Another wildcard that could slow down the 10-year bull market is a spike in the value of the U.S. dollar. As we saw in 2015-2016, a higher valued dollar makes American goods more expensive abroad, which will crimp corporate profits. Beyond these known unknowns, there are always what Donald Rumsfeld likes to call “unknown unknowns“. These unknowns can include things like terrorist attacks, currency crises, foreign bank defaults, natural disasters, etc. Short-term volatility typically ensues after these uncontrollable events, but history has proven our country’s resilience. With the new tax legislation voted into law and shift of IRS calendar, a cohort of investors may now choose to temporarily sell stocks during January, which could briefly lower stock prices. I fully understand stock prices cannot go up forever, but as long as the previously discussed four key pillars remain positive on balance, the New Year’s celebration can continue.